There are big advantages of telemedicine for patients and providers in general practice and all sorts of specialties. But the practice of gastroenterology has certain characteristics that make it particularly well suited for the approach. Here are a few reasons that gastroenterology practices might want to pay special attention to the increasing popularity of telehealth as a care delivery option. Experts predict a shortage of gastroenterologists by 2020. This prediction is not based on the number of physicians opting to enter this specialty, but instead, on the presumed demand. The international community is experiencing a flux of seniors and that is likely to increase the need for colorectal cancer screening. In order to meet the increasing demand of both GI procedures and standard appointments, practices will need to find ways to become more efficient. For certain types of visits, telemedicine offers the opportunity to see patients more easily and reduce the office overhead associated with each in person visit. Gastroenterologists treat a high number of patients with chronic illnesses such as Crohn’s Disease, Colitis, Hepatitis C, and others. Patients with these types of illnesses require frequent lab tests, medication checks, diet consultations and other non-acute care. Giving patients the option to use telemedicine for these types of visits eases the burden of living with a chronic condition and improves the odds that the patient will comply with follow up instructions. Having a long-term medical condition is difficult enough. Patients will be grateful for providers who can alleviate some of the expense, hassle and energy expenditure involved in in person visits. Telemedicine can add value to the practice of gastroenterology, making providers more efficient and effective and making health maintenance more convenient and less expensive for patients. 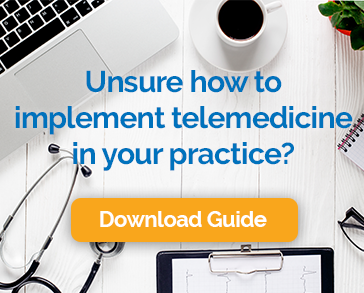 With modern technology, and progressive reimbursement laws in many states, there’s nothing to stop your practice from exploring how it might work for you.